It’s lesson eight of Level 1 and, though barely visible, there is an ember of confidence present in the kitchen. We just finished exam number one and we are ready to take on soups. Though their French designations sound unusual, the recipes’ English names are familiar and comforting: split pea, vegetable, French onion. Consommé is the more intimidating of the four, but come on—it’s just soup, right? Consommé is first up and things are going smoothly. Step one requires that I mash and mangle together a mixture of meat, egg whites, and vegetables to a consistency, which, I imagine, resembles stomach contents. My left hand is resting on my hip while I stir; I ooze tranquility and control. While our broths are clarifying, we are told to prepare the vegetables and aromatics for the next dish: potage cultivateur, or “farmer-style” vegetable soup. The name conjures a visual of produce, chunked in rustic glory, the product of a blue-collar worker with dirt under his fingernails. Instead, the soup requires meticulous attention to knife skills. Precision reigns in this dish, and nothing is gone about haphazardly—at least not intentionally. Before I can even contemplate my mise en place, we are expected to have moved on to preparing the split pea soup. It’s here where the lesson unravels, as does my mind. Things are boiling that should be simmering, the consommé is being neglected, bowls are accumulating for no good reason, I’m scrambling for the bacon, the butter, the scale, the peppercorns. My plan is taken hostage by a frenzied attempt at organization. I feel my cheeks pool with blood, my hands become shaky, and my heart is thumping underneath my uniform. And chef is calling for the consommé. I scatter hastily taillaged vegetables into a bowl and dump in my soup. The broth is frothy and I don’t have the capacity to devise a remedy so I bring it to chef and, just as his lips touch the spoon, I feel a wave of nausea as I realize: salt. I forgot the salt. He tries to find something positive to say, but, being there is zero seasoning, he quickly dismisses me. Back to the split pea soup. The peas are not fully cooked through but I don’t have the time to allow them to gently soften. I dump the soup into the communal soup bucket where it is blasted by chef, toting an industrial-size immersion blender. My partner and I finish off the vegetable soup, all the while panicking over the size of the bacon lardons, the lack of carrots, and the location of the doilies for plating. We taste and discover: it’s salty. Not a pleasant, puckering brininess, but a burn-the-back-of-your-throat saline solution. 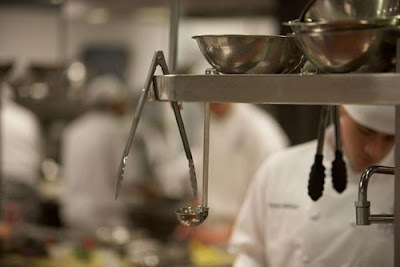 With the addition of water, we accomplish balance and present the final product to chef. He smacks his lips together after slurping the broth, makes a face that tells us he’s carefully analyzing the color, the flavor, the mouthfeel, and then he says, “Perfectly seasoned.” I am elated, elevated, and, above all, exhausted. We scramble to disassemble our work area; slosh sanitation solution on the countertops, toss bowls and pots and cutting boards onto the cleaning station, buff out stains from the burners with vinegar, which scorches my nose and makes my eyes tear. I can’t wait to get home and get the soup smell out of my pores. But I earned the stink on my uniform, the pain in my feet, and the ache in my back. We finish on time and leave, each of us with a quart of freshly prepared and pureed split pea soup and a hunk of crusty French bread. I enter the subway, squish into a seat, savagely tear into the bread, and dunk it into the soup. The strange looks I receive from surrounding commuters barely penetrate me. I was officially initiated into the culinary world and earned some chops tonight, and I’ll be damned if I don’t get to eat some soup. Jax Hubbard is a registered dietitian, freelance food writer, and Classic Culinary Arts student at The French Culinary Institute. She aspires to eat well, cook without inhibition, and live to write about it.